When first starting with cloth diapers, often the biggest question is not how to use diapers nor how to store them, but how to wash them. And detergent is the most important part of washing diapers. Choose the wrong detergent and you can end up with leaky, stinky diapers that leave a rash. Not a glowing endorsement for cloth diapering! But choose the right detergent, and you can have years of worry-free diapering with an easy wash routine. But how do you find the "right" detergent? And what do you do if you choose the "wrong" one? First, the list of recommended detergents. Mountain Green, Country Save and Planet are the very best choices from your local store if you can find them. In some areas, these detergents are common, in others they're harder to find. Country Save and Planet are both recommended by most diaper manufacturers. Tide Free, Purex Free, and Arm&Hammer Senstive Skin are all pretty good choices from the regular detergent choices. These may or may not be recommended by diaper manufacturers, usually due to the presence of optical brighteners and enzymes. Shopping for detergent online gives you an array of diaper-specific detergents. These are made specifically for use with cloth diapers and every manufacturer I know of okays these for use with their diapers. BumGenius, Tiny Bubbles, and Rockin' Green (unscented version). Allen's Naturally is also a great choice that is almost always only available online. 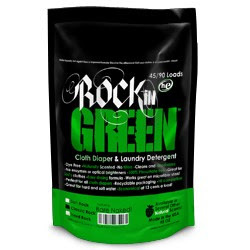 Many of these great detergents are sold by our fine Knickernappies retailers! Click here to locate a retailer near you! While most detergents by far fall into the middle (might work for some but not for others), there are some generally BAD choices to be found. Most manufacturers specifically recommend NOT using these detergents: Dreft, ALL Baby, ALL Small&Mighty, and ALL Ultra. These are the worst offenders due to the presence of pure soap products which can leave a nasty buildup on diapers. Other BAD choices are BioKleen, Ecover, and most baby-specific detergents. It's important to note that choosing a Good detergent doesn't mean it will work for your diapers. It also depends on your local water quality and your washing machine. But in general, starting with a Good detergent is the best place to start! I've found that most parents are mostly successful with one of these detergents. What do you do if you get a detergent that's not working? Watch tomorrow for our post on stripping detergent residues out of diapers! *Sources: My own experiences, the Real Diaper Industry washing guidelines, Happy Heinys washing instructions, BumGenius washing instructions, FuzziBunz washing instructions, GroVia washing instructions, Knickernappies washing instructions. i make my own detergent. It saves a bunch of money and I know its much better than the commercial stuff. I have been switching around on detergents until I find the right one. I am on RnG now. Hopefully this one works! I use country save and believe that i had no problems because I used it.